The successful Culinary Enrichment and Innovation Program (CEIP), a collaboration between The Culinary Institute of America (CIA) and the foodservice division of Hormel Foods (NYSE: HRL), has announced the 16 students who will comprise its CEIP Class of 2014. The students, who hail from 12 different states, represent foodservice operations in both the commercial and non-commercial segments ranging from multi-unit restaurants to universities to hospitals and senior living. Their 18-month journey of culinary excellence will begin April 16, 2013. CEIP is the only professional development program to offer advanced management training specifically designed for skilled chefs. Now beginning its third session, CEIP received a record number of applications for the Class of 2014, attesting to both the heightened awareness and effectiveness of the program. While the minimum requirement for entry into the program is five years of professional experience, each of this year’s chosen chefs has at least 15 years in the field. “The whole CEIP program is about enrichment and innovation. In our previous graduating classes we’ve seen how the participants use the information they’ve learned to better their menus, to challenge their purchasing position, and to try to get better products into their establishments,” said Dave Kamen, project manager of CIA Consulting and newly appointed CEIP program director. While the previous CEIP sessions were held at one or two of the CIA’s campuses, the Class of 2014 will be the first to attend modules at all three of the Institute’s North American facilities: St. Helena, Calif. (module 1), San Antonio, Texas (module 2), and Hyde Park, N.Y. (modules 3 and 4). This will give the class the unique opportunity to experience the seasonal differences in the CIA’s programs across the country, as well as be exposed to a wider array of Certified Master Chefs. The program’s objective is to teach an elite group of professional chefs how to identify, practice and master the necessary skills for culinary leadership and innovation. CEIP participants gather for three intense days every six months, disconnecting from their daily responsibilities as senior level chefs and immersing themselves in lectures, homework, hands-on kitchen work and one-to-one dialogue with fellow chefs and visiting guest lecturers. Consisting of four academic and experiential modules, CEIP covers a range of topics, including: global flavor traditions; ethical responsibilities of healthful, flavorful food preparation; leadership and innovation; and menu R&D as a collaboration of culinary arts, consumer behavior, food science and management. This year’s participants will explore everything from the relationships among the five senses, to principles of Modernist Cuisine. They’ll also tour a local farm and winery, create food focused on world flavor traditions to better understand its profit potential, and explore novel approaches to developing new applications that help differentiate their operation. The educational modules of CEIP were originally created in 2008 for the inaugural CEIP class, but have steadily evolved since that time to reflect changes in the foodservice industry. Among those attending will be several chefs from colleges and universities, including: University of Southern California Executive Chef Eric Ernest, who oversees menus and training for 40 unique locations on two campuses; and Boston College Associate Director of Food and Beverage Michael Kann, whose pre-culinary school biochemistry background gives him unique insights into food. Attending from the healthcare segment isChristina Bodanza, executive chef at Watermark Retirement Communities, who is also certified as a dementia practitioner by The National Council of Dementia Practitioners; and Justin Johnson, executive chef at the University of Wisconsin Health Partners Watertown Regional Medical Center, who revolutionized foodservice in a local retirement home and is in the process of doing the same at a hospital. Others in the class include Mary Grace Viado Howard, corporate executive chef at the 11-unit Village Tavern restaurants, who was challenged with ensuring the food made with local ingredients at the chain’s Philippine location tasted the same as its American counterpart; and Martin Pfefferkorn, executive chef of the Hyatt Regency Atlanta, an Austrian-born chef who had extensive experience working in European hotels before coming to the U.S. to live in the Upper Midwest, Southwest, and Southeast. 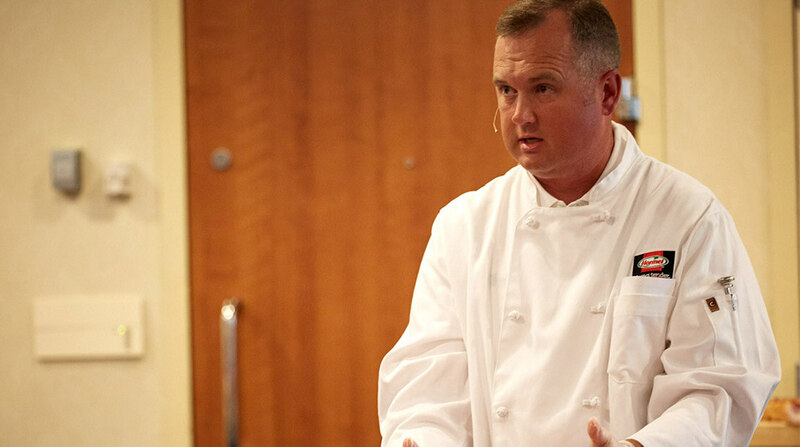 “We want to help these chefs see the world a bit differently, so they can bring a broader vision and wider horizons to their organizations, and ultimately the industry at large,” said Bill Dion, product innovation team leader for the foodservice division of Hormel Foods. The company is a co-founder of the program and has underwritten the development of the curriculum. It also sponsors the tuition for each of the participating students. “We feel we’re helping to prepare today’s best and brightest chefs for leadership in our industry,” Dion said. For more information on the program and the Class of 2014, please visit www.ceipinfo.com. Mary Grace Viado Howard, Village Tavern, Inc.
Hormel Foods and BBDO Celebrate 83rd Anniversary From Spam to Dinty Moore stew to Jennie-O turkey, BBDO has serviced every Hormel brand since 1930. Founded in 1946, The Culinary Institute of America is an independent, not-for-profit college offering bachelor’s and associate degrees, as well as certificate programs, in either culinary arts or baking and pastry arts. The college has campuses in New York, California, Texas, and Singapore. In addition to its degree programs, the CIA also offers courses for professionals and food enthusiasts, as well as wine education. For more information, and a complete listing of program offerings at each site, visit the CIA online at www.ciachef.edu.